Sharyn Mackey, right, and radiotherapist Anna Huynh with the Icon Centre''s radiotherapy technology. At the best of times, Sharyn Mackey hates tattoos. 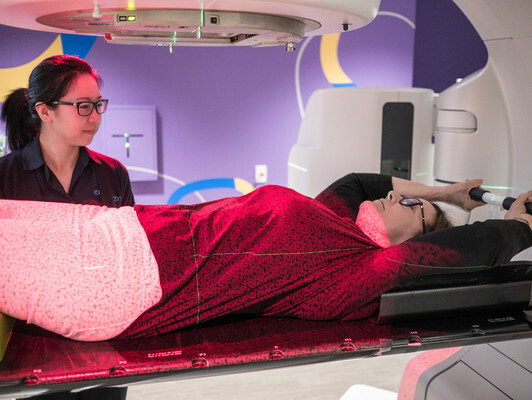 The 63-year-old breast cancer patient was certainly not looking forward to the tiny permanent marks on her chest as part of traditional radiation therapy. However she is one of the first beneficiaries for a new technology at The Icon Cancer Centre, Mulgrave that eliminates the need for tatts. The AlignRT technology uses non-invasive light from cameras to pin-point radiation treatment into a precise location. Ms Mackey said she didn’t want to be permanently reminded of her treatment by tattoos. “It’s more comfortable for the patient and you don’t have to get tattoos done,” Ms Mackey said. The centre is the first private provider in Australia to use the technology. It intends to use the AlignRT for a range of cancer types. Icon Group chief executive Mark Middleton said the company was focused on being an “early adopter” of technology. “It’s our firm belief that people should have access to quality cancer care as close to home as possible.